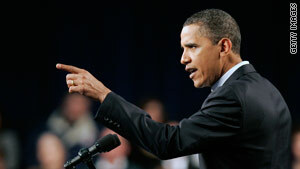 President Obama needs to reassure the nation and members of his own party with his speech, analysts said. Washington (CNN) -- President Obama's State of the Union speech Wednesday will be a tough sell for millions of Americans struggling under the weight of an economic recession, political analysts said. "The president will respond as he always does to emergencies: with a speech. In this case, it's his State of the Union address," said David Frum, a CNN contributor and former speechwriter to President George W. Bush. "The Obama team always assumes the best remedy for any Obama difficulty is more Obama." Frum said Obama's new populist tone, which he said emerged after the Democrats' surprising loss in the Massachusetts special Senate election, might work short-term if he uses it in Wednesday's speech, but it won't work over the long haul. "If so, it would be a big mistake. It may win the president an immediate bounce in the polls by exciting downcast liberals and progressives," Frum said in a CNN.com commentary. "But that bounce will prove limited and short-lived, and it will come at the expense of more trouble not very far down the road." Obama is expected to announce that he'll freeze discretionary spending in the federal budget, and his Middle Class Task Force has recommended further tax credits and economic support meant to reassure Americans nervous about the pace of economic recovery. Democratic strategist Bob Shrum said that a rousing speech on Wednesday isn't necessarily the best approach. "A speech can't make people believe that he's going to do the jobs thing. Only the creation of jobs is going to reassure people," he said. Obama has faced widespread criticism for his handling of the economy by Republicans and independents. The current unemployment rate is at 10 percent, up from 7 percent when Obama took office. The president not only needs to reassure Americans that the country is headed in the right direction but to reassure Democratic members of Congress that the party is going to be OK, said Nathan Gonzales, political editor of the Rothenberg Political Report. "The president's going to be delivering a speech on the heels probably of some more Democratic retirements in the House, some members who after Massachusetts see that it's probably easier to hang it up than run a tough campaign for a year and lose," he said. "Democrats are probably looking for the president to lead and not leave the details to Congress [on health care reform], which he has done over the last year." And those concerns are seen among some Democrats. On Monday, a group of fiscally conservative Democrats known as the Blue Dog Coalition sent a letter to the president urging him to address federal spending. Specifically, they asked him to support a freeze on all nondefense discretionary spending in the upcoming fiscal year 2011 budget. "I hope the President will use this historic moment to shine the spotlight on our troubling fiscal policies and lay out his plan for addressing these challenges head-on," Rep. Brad Ellsworth, D-Indiana, said in a press release. Later Monday night, two senior administration officials said the president will announce Wednesday night that he's proposing to save $250 billion by freezing all nonsecurity federal discretionary spending for three years. The freeze, which could help position Obama in the political center by sharpening his credentials on fiscal discipline, would exempt the budgets of the departments of Defense, Homeland Security and Veterans Affairs, along with some international programs. The officials would not reveal the details of which domestic programs would be cut, as they prepare to face major pushback from liberals in the president's own party because popular education and health spending could be on the chopping block. Other presidents in their first term faced similar economic hurdles Obama is facing. In their first State of the Union speeches, President Reagan in 1982 and President Clinton in 1994 aimed to ease the nation's worries about tough economic times. "While not quite as dramatic as Bill Clinton's announcement in his 1996 State of the Union address that the 'era of big government is over,' Obama is signaling that he wants to appeal to centrist voters concerned about government spending," said Julian Zelizer, a presidential historian and CNN.com columnist. Douglas Brinkley, a presidential historian, said Obama needs to "sell jobs, jobs and more jobs" in his speech. "It's essential that, like Clinton, he lets the American people know he feels their pain," Brinkley said. "And he needs to use fierce Reaganesque language about smashing al Qaeda. Due to the Christmas bomber debacle, Obama must explain in detail new innovative ways his administration is protecting U.S. citizens from terrorist attacks." Zelizer argues that the real test for Obama will come after the speech, when liberals react to his center-driven approach. He wrote in a CNN.com opinion piece that Obama cannot afford a battle with liberals. "It could leave him without any strong base of support and fuel the perception that he is an ineffective leader, something else independent voters don't tend to appreciate," he wrote. "If the president backs too far away from the issues that animated his supporters in 2008, he could find himself facing even stronger challenges from liberals and depressing the base of support that he will very much need going into 2012." Zelizer notes that there has been a long tradition of Democratic presidents taking the left for granted, which resulted in a cost to their administrations. He pointed to the Johnson, Carter and Clinton presidencies as examples. And on health care reform, liberals have been pushing for a strong government-run public option to help stem the rising costs coming from private insurance companies. Although the House bill contains a public option, the Senate bill does not, which has appealed to moderate and conservative Democratic senators. Frum and Shrum, meanwhile, admitted that the president must continue to fight for health care reform. Backtracking or giving up on the issue will be Democrats' "Jonestown," Frum said. Shrum said that if he walks away from health care, the Democratic party is in "serious difficulty." "We're going to see the country wait another 10 or 15 years before there's action on an issue which could not only cripple our economy, but which involves a fundamental unfairness to tens of millions of people," he said. Gonzales admits that the American people are not expecting these problems to be solved in the short term, but they do want to see progress. "The rhetoric from the White House has to match up with reality," he said.